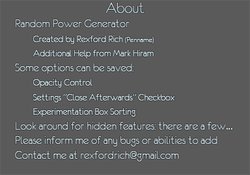 Check out Random Power Generator! 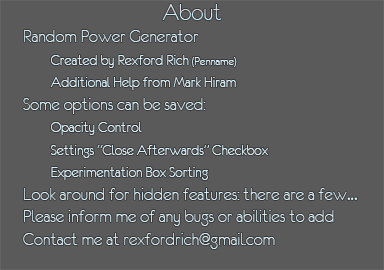 With Random Power Generator you are able to randomly select [a] power(s) for the intended purpose of helping you decide the abilities for your own superhero; additionally you can use it for your own creativity. Download links are towards the bottom of the page. At its homepage more information, details and more versions are available. Please head on over there! There are a number of things you can do with this program. At the end of the page is a picture of the program itself, showing some of the purposes of this app. 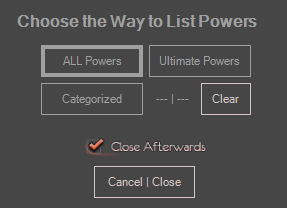 Added features: Drag and drop abilities onto Experimentation List from the Powers and Abilities List, drag and drop .abl files onto Experimentation List from windows explorer, and open .abl files with Random Power Generator from the desktop. Release 2: Fixed bug where after clicking the About button the text would not reset when re-selecting abilities from the lists.